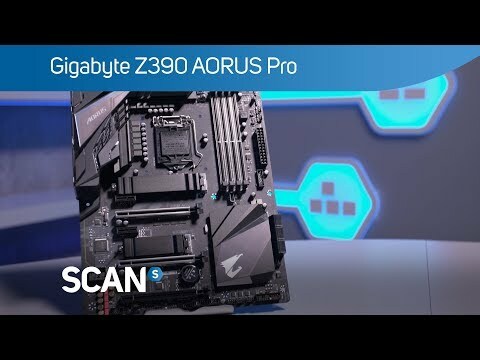 DOMINATE THE FUTURE WITH AORUSThe ultimate gaming Z390 motherboard, GIGABYTES AORUS Pro Wi-Fi is packed full of interesting and useful technology, ranging from audio, through performance and even customization. The AORUS Pro Wi-Fi motherboard is reinforced with ultra-durable components on the memory and PCIe slot armour, and components such as top-end capacitors. The Z390 board’s customisation and its intuitive UI through the RGB Fusion app allows you to make your AORUS board your own. Incredible precision when delivering powerZ390 AORUS PRO motherboard uses an 12+1 phases digital CPU power design which includes both digital PWM Controller and DrMOS. These 100% digital controller and additional 8+4 Solid-pin CPU Power Connectors offer incredible precision in delivering power to the motherboard's most power-hungry and energy-sensitive components, allowing enthusiasts to get the absolute maximum performance from the new 8-core 9th Gen Intel® Core™ processors. faster and undistorted current deliveryZ390 AORUS PRO WIFI uses very high performance thermal design by combining 2 heatsinks with Heatpipe, thick thermal pad, providing ultimate MOSFET cooling performance for enthusiasts, overclockers and gamers. AORUS M.2 Thermal Guard AORUS Gaming Motherboards are focused on delivering M.2 technology to enthusiasts who want to maximize their system's potential. Z390 AORUS motherboards offer the industry's best compatibility in terms of NVMe storage for users who demand high capacity and seek the best performance. GIGABYTE provides a thermal solution for M.2 SSD devices. The M.2 Thermal Guard prevents throttling and bottlenecks from high speed M.2 SSDs as it helps to dissipate heat before it becomes an issue. All New Realtek High-End HD Audio Codec ALC1220 120dB(A) SNR HD Audio with Smart Headphone Amp automatically detects impedance of your head-worn audio device, preventing issues such as low volume and distortion. With the new VB series audio controller, stream your voice to the world vibrantly with both front/rear microphone SNR up to 110/114dB. The AORUS motherboards boast a combination of Hi-Fi grade WIMA FKP2 capacitors and high-end audio capacitors. While the high-end audio capacitors are suited for high-grade audio equipment, using state of the art technology to provide rich sound in the bass and clearer high frequencies, the WIMA FKP2 capacitors are being used widely in premium grade Hi-Fi systems. INTEL® WI-FI AC & BLUETOOTH Intel® GbE LAN features cFosSpeed, a network traffic management application which helps to improve network latency and maintain low ping times to deliver better responsiveness in crowded LAN environments. Intel Next-Gen Wireless solution supports 802.11ac Wave 2 function, enables gigabit wireless performance, provides smooth video streaming, better gaming experience, few dropped connections and speeds up to 1.73Gbps. Double the speed compared to the previous generation. Moreover, Bluetooth 5 provides 4x range over BT4.2 and with faster transmission. More metal quantity to sustain higher power and generated heat Z390 AORUS motherboards feature solid plated ATX 24pin & ATX 12V 8pin + 4pin power connectors to offer a stable power supply during CPU overloading. Having a Solid Pin means there is a larger contact are for electricity whilst stil being ultra durable for a longer lifespan. Will it ship with the latest bios version? What version will it come with and will it support a 9th gen cpu when shipped or will I have to flash a new bios?